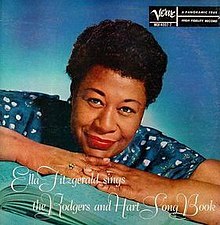 Ella Fitzgerald Sings the Rodgers and Hart Song Book is a 1956 studio album by the American jazz singer Ella Fitzgerald, with a studio orchestra conducted and arranged by Buddy Bregman, focusing on the songs written by Richard Rodgers and Lorenz Hart. This album was inducted into the Grammy Hall of Fame in 1999, which is a special Grammy award established in 1973 to honor recordings that are at least twenty-five years old, and that have "qualitative or historical significance." 2012: Verve also released an audiophile, downloadable version of the LP in up to 192 kHz/24 bit lossless FLAC quality. All songs composed by Richard Rodgers and all lyrics written by Lorenz Hart. Buddy Bregman - Arranger, Conductor. Liner notes by Richard Rodgers, Oscar Hammerstein II, William Simon and Norman Granz. ^ "Ella Fitzgerald Sings the Rodgers and Hart Song Book Review". AllMusic. Retrieved October 19, 2014. This page was last edited on 16 May 2018, at 06:13 (UTC).